I began my career in the mid 1990s, mainly acting as Master of Ceremonies at charity events and running fund raising auctions. Following training with the London Guild of Toastmasters I have worked at many and varied events – English and Asian weddings , Civil Ceremonies, Formal Dinners, Charity Balls, School Proms, Awards Ceremonies, Ladies Lunches , Sporting events, Auctions and Special Birthdays & Anniversaries. 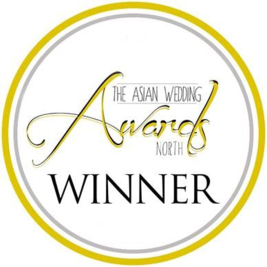 My work as a Toastmaster with the Asian Community led to me being awarded the Asian Wedding Experience Toastmaster of the Year Award in January 2016. With experience of over 250 weddings throughout the UK in varied venues including Stately Homes, Hotels, Barns, Marquees, Community Halls , Golf Clubs and Banqueting Halls with 30 to 1200 guests I am versatile and prepared to cope with all eventualities. I am a member of the Northern Guild of Toastmasters and have public liability insurance. For your big day you will have chosen many professional services (florists, cars, photographer) but the planning and running of the reception is often overlooked. Toastmasters today manage the proceedings so that you do not have to worry about ‘what happens next’. “Without Malcolm’s guidance and help both on the night and prior to the event, the evening would not have run as smoothly and successfully in raising so much money. Using a wide range of adapted methods, I will strive to raise you the most money from an event as possible, whilst still ensuring that your guests have a great time! I have vast experience in running auctions, in particular, charity auctions. From teddy bears to holidays I have had the pleasure of auctioning many and varied prizes. I have many years’ experience with Asian weddings of various sizes from 350 to 1200 guests. I enjoy experiencing the different cultures and this year I am the proud winner of the Asian Wedding Experience Toastmaster of the Year Award. At Hindu weddings I will assist with the welcoming of the Baraat by the Bride’s family. This could include the Milni and, of course, any of the ‘customs’ that have been discussed. After the ceremony, I will help the photographers by introducing the families for the photo shoot (if required). I will announce any refreshments during the day and again announce the entrance of the Bride and Groom, announce any speeches and of course, the cutting of the cake, the first dance and the start of the party! Depending on the ceremony and the family’s wishes, I will also assist with organising the Vidai. For Muslim weddings, either Nikkah or the Walima, I will assist in welcoming your guests and then help to get them seated before announcing the important entrance of the Bride and Groom – either together or individually, depending on the ceremony and the family’s wishes. After the ceremony, I will assist with the family photographs, helping the photographers by organising the families for the photo shoot. I will also organise the cake cutting ceremony and any other ‘ceremonies’ as requested by the families. Where appropriate, I assist in the departure from the Hall of the Bride or the Bride and Groom at the end of the wedding. The function of the Toastmaster at Dinners is to ensure the orderly development of proceedings throughout the event. From the time of the arrival of the first guests until the last guests leave, the Toastmaster serves as an unobtrusive organiser, vital to the success of any large event. I am fully conversant with the etiquette and protocol required for Civic Occasions with dignitaries and VIPs and have had experience of being in attendance at functions with the Prime Minister and Members of Parliament. 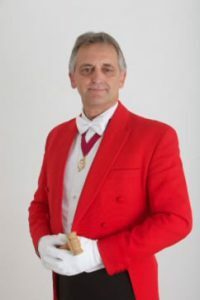 I am fully conversant with the etiquette and protocol required for Civic Occasions with dignitaries and VIPs and have had experience of being in attendance at functions with the Prime Minister and Members of Parliament.Whether you require the full white tie and red tailcoat for a formal event, dinner jacket or lounge suit for a more informal occasion I am happy to provide the style you prefer.